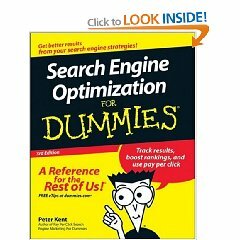 I came across Search Engine Optimization for Dummies on Amazon today: After a quick tweet fuelled by my thoughts on the topic, I thought that I should perhaps elaborate on exactly what I meant. That’s good practise, and that will always help your website; if not from a search perspective, doing things like URL prettifying will make more sense to your users, rather than loads of random text, numbers, question marks and ampersands spewed all over the address bar. But this kind of “optimization” is just a farce – a form of business which just goes to screw people over by charging them for the belief that they can be in the top 20 search results – something they’re not actually going to be able to achieve, and often in cases don’t deserve. Not because the content isn’t good (necessarily) but because there are a million other sites out there doing what they do, and a proportion of them are better than they are. [Google] can’t tell you how to make a perfect result and how to get that top 10/20 ranking and so then everybody goes to the next best thing which is an SEO. And the SEO sells them the belief that they actually deserve it. The best thing you can do is focus on creating great content, and do some of the web development basics to make your pages semantically clear to search engines. Nothing comes for free, so if you want to be in the top results, you’d better make sure you have top content that is presented in an easy to digest manner. If your content is good, then people will start to like what you’re doing, which in turn will make you index better (through links, etc). If you do that and invest your time and effort into your site, you don’t need a conman to sell you a lie.